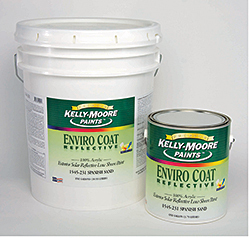 Enviro Coat Reflective 1545 is an architectural coating designed to reflect the sun's radiant heat. This exterior, 100-percent-acrylic eggshell paint lowers external wall temperatures allowing building operators to minimize air conditioning and save money on utility bills. When applied to vertical outside walls, it deflects a portion of the sun's radiant heat away from the building.